Packed with punch, "GREEN" is our strongest deodorant for men and women looking to switch from commercial antiperspirants. Anti-bacterial essential oils of Melaleuca, Niaouli, Rosemary and Clove give this 100% natural deodorant heavy odour fighting ability without the overpowering scent of commercial deodorants. Finally, a natural deodorant that really works! 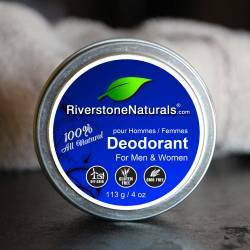 * A natural deodorant that actually works! Money Back Guarantee! * Powerful antibacterial essential oil blend reduce bacteria and odor. * Chosen favorite by marathon runners and athletes. 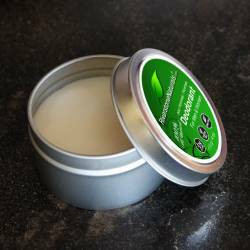 * Coconut Oil and beeswax are naturally active against bacterial, yeast, and fungi. * Beeswax is naturally antiseptic (disinfectant). * Absorbs sweat, moisture and body odors. * Say "Goodbye" to aluminum-based deodorants! 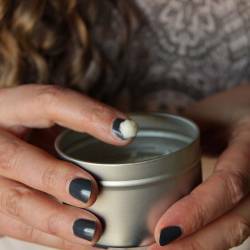 Simply use the back of your fingernail or our deodorant applicator pad to scoop a small "pea" sized amount from the tin. Apply with your fingers/pad by gently rubbing the deodorant cream onto the underarm area, as required. Caution: Contains Baking Soda. If irritation or rash occurs, discontinue use. 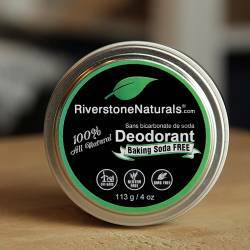 Contact us for full credit and we'll send you a free sample of our Baking Soda Free Deodorant. Typically a concern for 5% of people. * Store in a cool dry place with lid closed. * Shelf Life: One year unopened. Once opened, freshest if used within 6 months. The information on this page has not been evaluated by the Food and Drug Administration. This information is not intended to diagnose, treat, cure or prevent disease. Any and all claims of healing properties are based on widely accepted scientific research done on the properties of the individual ingredients. Always consult a physician regarding health conditions.